Pediatric chiropractic care is becoming an increasingly popular choice to not only alleviate neck and back pain in kids of all ages, but also to help with other symptoms. As children grow, it is essential for them to have proper spinal and nervous system health. Kids have a great deal of stress placed on their spines and need proper treatment in order to have a healthy spine and nervous system. Research demonstrates that chiropractic care is a safe and cost-effective option for children of all ages. An article in the January 2007 issue of Pediatrics (the official journal of the American Academy of Pediatrics) described chiropractic as the most common complementary and alternative medicine practice used by children. At ProMotion Chiropractic, it is not unusual to hear parents state that since starting chiropractic care their children get sick less frequently, have less ear infections, sleep better, have a better temperament, and infants are able to nurse better. Since the nerves collectively control and influence all bodily functions, ensuring proper spinal health may help with a variety of health conditions. Parents report improvement with many conditions, such as colic, constipation, ear infections, allergies, sinus infections, persistent bed-wetting, "growing pains", headaches, back and neck pain, scoliosis, reflux and feeding problems. There are several times in a baby's first year of life when chiropractic examinations are especially important: after the birth process, when the baby starts to crawl, when the baby starts to stand (fall) and when the baby starts to walk. All of these events can be traumatic on an infant and child's developing spine. Pediatric chiropractic care is safe, comfortable and effective in many childhood complaints. A few unexpected benefits of chiropractic care for children have also been noted, such as improved sleeping, improved behavior and attitude and improved immune system function. 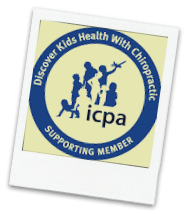 Visit the International Chiropractic Pediatric Association website for more information on chiropractic care for children and research studies. Want more information and the latest research on the benefits of chiropractic care for children? International Chiropractic Pediatric Association Website (ICPA).